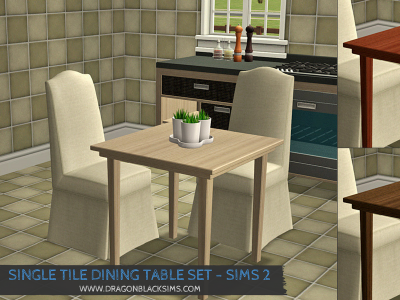 There never seems to be enough single tile dining tables for Sims. Especially sims just starting out in small homes/apartments with limited space. So I thought I would make a small set of single tile dining tables. Repository has been used. See below for more information. The Ellis Dining Table is the Master Mesh. All the other tables get their textures from this file. This mesh needs to be installed for the other tables to show correctly. 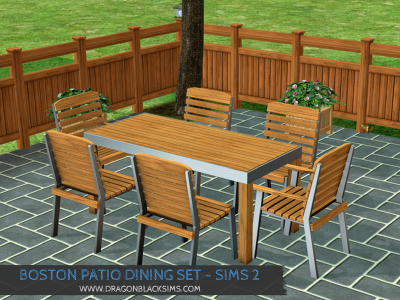 The Boston Patio Dining Set consists of a 2 x 1 table, a 1 x 1 table, dining chair both with and without armrests. Both table and chairs have 2 recolorable parts. There is one additional recolor included within this set. Repository has been used with this set. The chair with no arms takes its textures from the main chair. 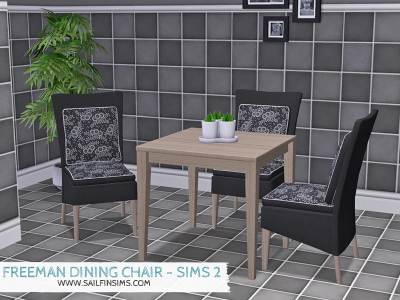 The 1×1 table takes it textures from the larger dining table. The master packages files are required for the other items to show correctly in-game.